Visits Egypt as Envoy Extraordinary. Farmer of the Egyptian royal revenues from about 220 to 198 B.C. ; nephew, on his mother's side, of the high priest Onias II. ; founder of the Tobiade family, which held an important place in the politics of Judea until the execution of its last member, Menelaus (162 B.C.). When Onias withheld the tribute at the time of Ptolemy IV., Philopator, Athenion was sent to Judea to insist upon its payment. 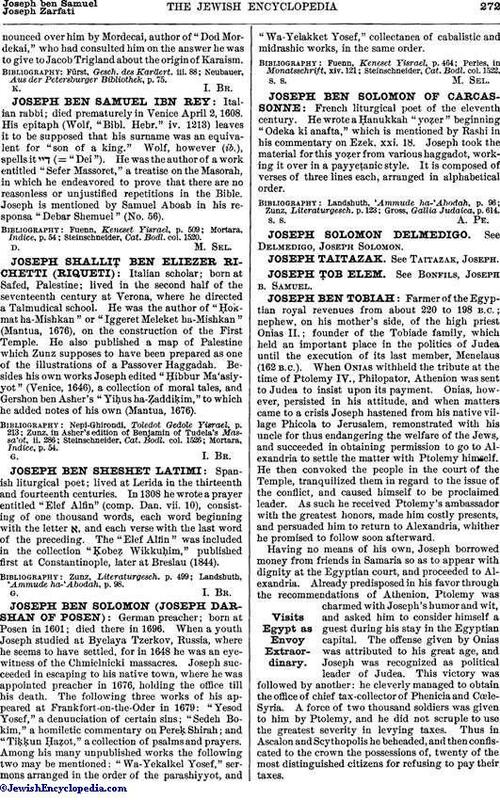 Onias, however, persisted in his attitude, and when matters came to a crisis Joseph hastened from his native village Phicola to Jerusalem, remonstrated with his uncle for thus endangering the welfare of the Jews, and succeeded in obtaining permission to go to Alexandria to settle the matter with Ptolemy himself. He then convoked the people in the court of the Temple, tranquilized them in regard to the issue of the conflict, and caused himself to be proclaimed leader. As such he received Ptolemy's ambassador with the greatest honors, made him costly presents, and persuaded him to return to Alexandria, whither he promised to follow soon afterward. Having no means of his own, Joseph borrowed money from friends in Samaria so as to appear with dignity at the Egyptian court, and proceeded to Alexandria. Already predisposed in his favor through the recommendations of Athenion, Ptolemy was charmed with Joseph's humor and wit, and asked him to consider himself a guest during his stay in the Egyptian capital. 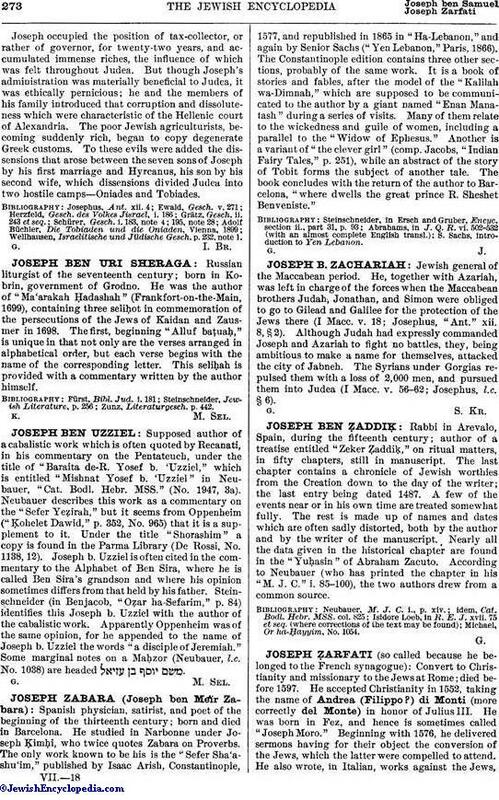 The offense given by Onias was attributed to his great age, and Joseph was recognized as political leader of Judea. This victory was followed by another: he cleverly managed to obtain the office of chief tax-collector of Phenicia and Cœle-Syria. A force of two thousand soldiers was given to him by Ptolemy, and he did not scruple to use the greatest severity in levying taxes. Thus in Ascalon and Scythopolis he beheaded, and then confiscated to the crown the possessions of, twenty of the most distinguished citizens for refusing to pay their taxes. Joseph occupied the position of tax-collector, or rather of governor, for twenty-two years, and accumulated immense riches, the influence of which was felt throughout Judea. But though Joseph's administration was materially beneficial to Judea, it was ethically pernicious; he and the members of his family introduced that corruption and dissoluteness which were characteristic of the Hellenic court of Alexandria. The poor Jewish agriculturists, becoming suddenly rich, began to copy degenerate Greek customs. To these evils were added the dissensions that arose between the seven sons of Joseph by his first marriage and Hyrcanus, his son by his second wife, which dissensions divided Judea into two hostile camps—Oniades and Tobiades. Wellhausen, Israelitische und Jüdische Gesch. p. 232, note 1.